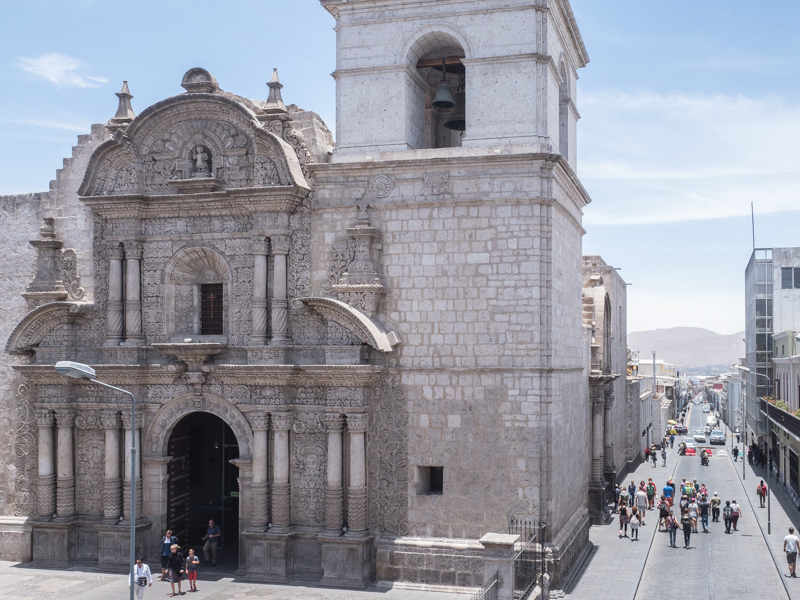 As mentioned briefly in our last blog, we left Colca Cañón on Weds. Nov. 1 and on our drive over the highest pass to date at 15,947′ we drove through the vicuña preserve. 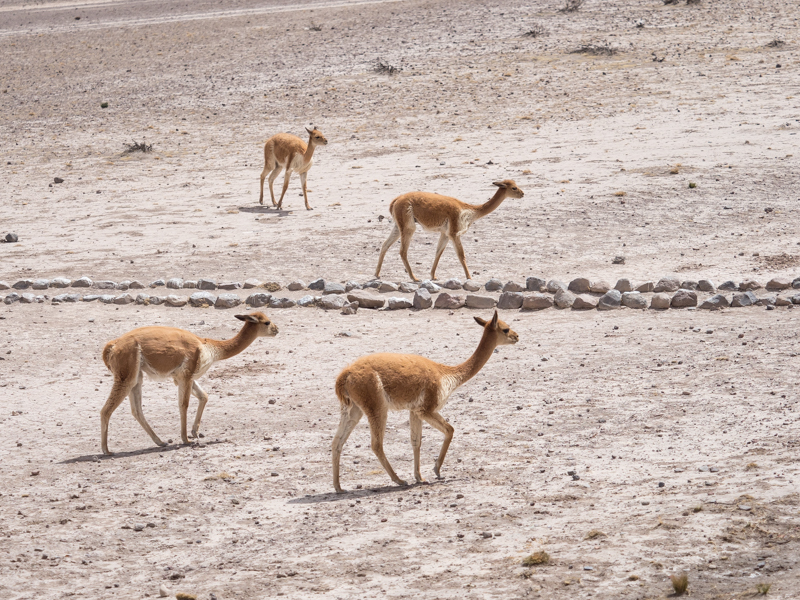 In places the preserve looked like dried up salt lakes and we did see vicuña herds along the way. 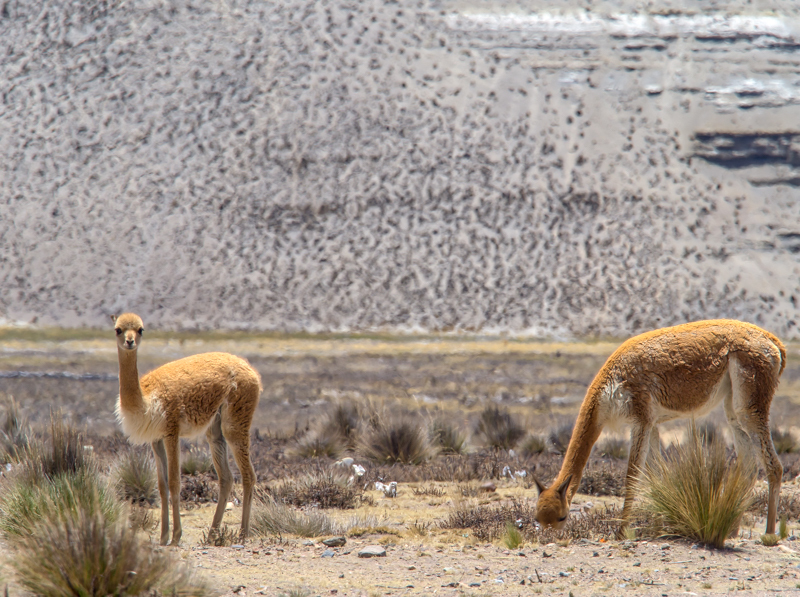 Wild Vicuñas on Peru’s Pampas Blanca. 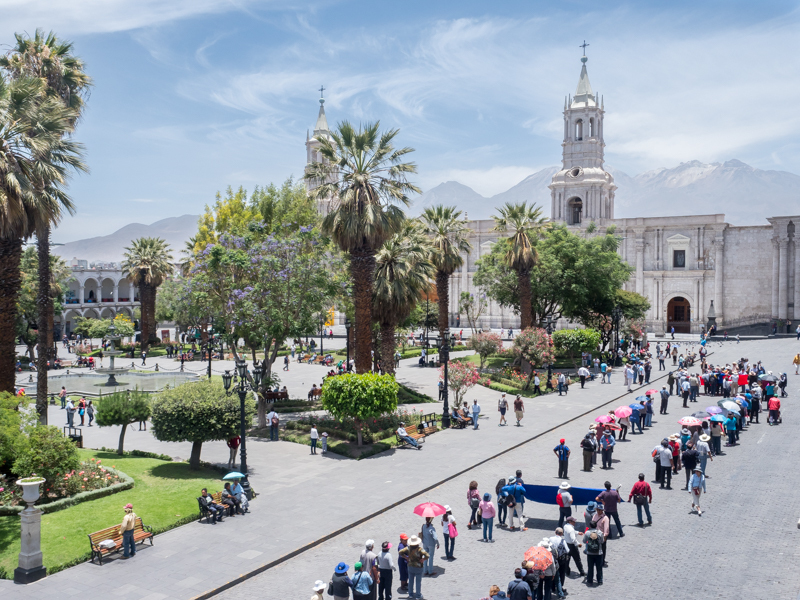 Arequipa, a industrial and mining city of approx. 1m people, spreads out for miles and is situated at approximately 5800′ in an arid desert surrounded by volcanos. The temperatures are generally in the 70’s and it is sunny for 9 months of the year; with only three months making up their rainy season. We pulled into our RV spot, Hotel Las Mercedes and the parking area is a narrow strip of grass. In fact to get to a spot, two other Overlanders, a French couple with their two young children and a German man with his Peruvian wife, had to pull in awnings and move their tables and chairs so we could pass. On Nov. 2 we walked to the historic center to join a free Walking Tour. The young guide had lots of stories but I don’t know how much of it was true. She took us to the main square, Plaza de Armas, and told us about the Cathedral, but didn’t go in. Next on the tour was the Jesuit’s Compania de Jesus and she explained one painting. We visited the school next door then off to the Mercado. Then things got dicey. She took us to four vendors and essentially wanted us to buy off those vendors. We left the tour after the final one. 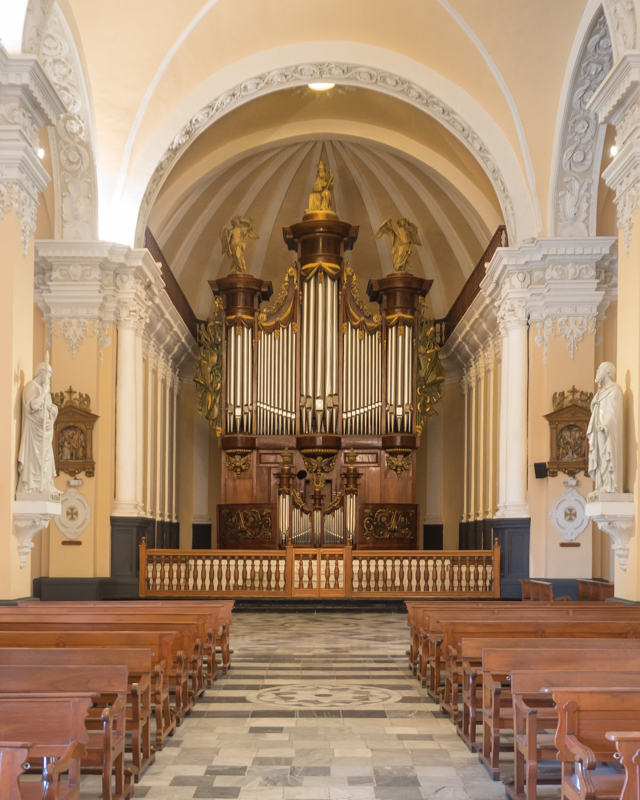 The largest organ in South America. It was damaged when shipped from Belgium, and was out of tune for 100 years. Instead we went to lunch at a TripAdvisor recommended restaurant -Zig Zag; turned out to be a good choice. Excellent salmon and alpaca served on sizzling hot Volcano rocks. And excellent Peruvian wines! Nov. 3 turned out to be a cleaning day to get out all the dirt and dust from our three days on dirt roads with Dave doing the truck interior and I did the camper. And in the afternoon we walked the block and half to a large supermarket and stocked up. This Convent is a city within a city and covers five acres. 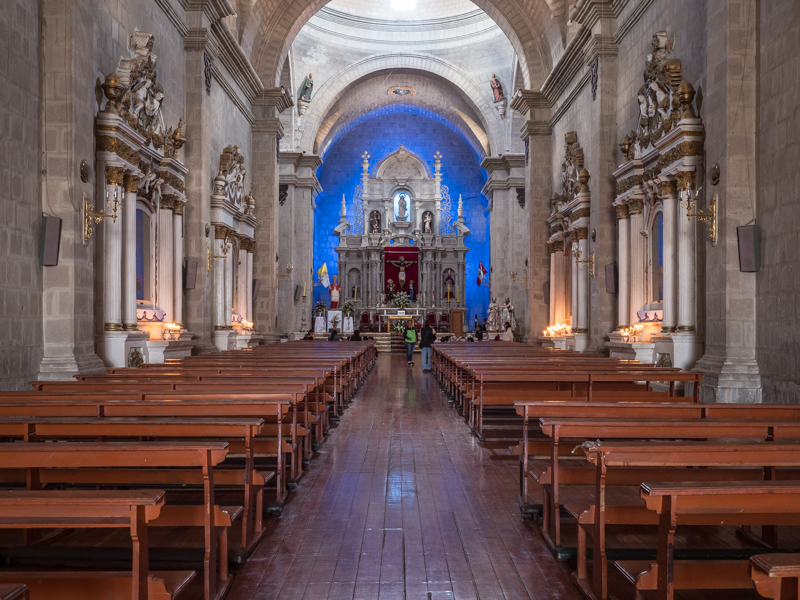 During the renovation leading up to the re-opening in 1970, they discovered over 400 art pieces that subsequently have been restored and a large number of the art pieces are hanging in two large exhibition halls set out in the form of a cross. That day we lunched at another TripAdvisor recommendation – Dimas – which also turned out to be wise choice. Sunday, Nov. 5 we got to the Plaza early so Dave could photograph the Plaza’s surrounding building colonnades in the best light. 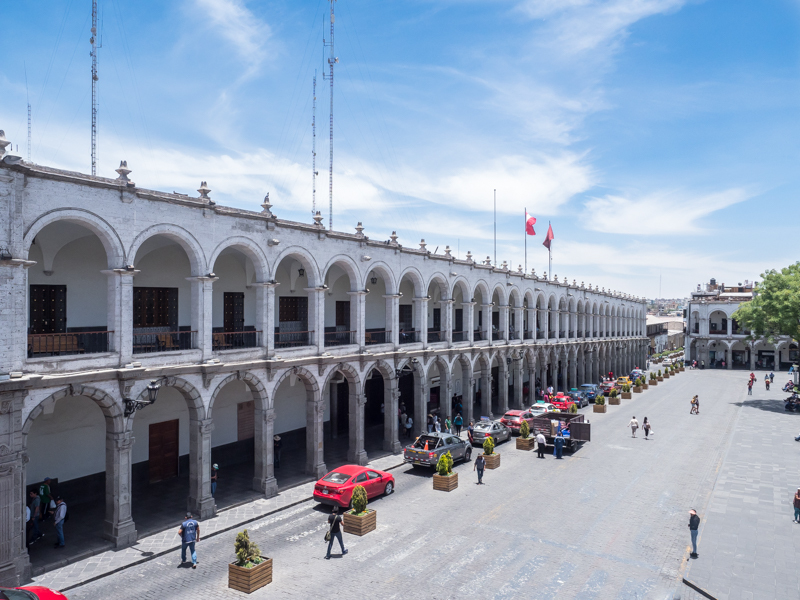 After photographing the buildings, we had a late breakfast in one of the restaurants on its second floor balcony overlooking the Plaza. 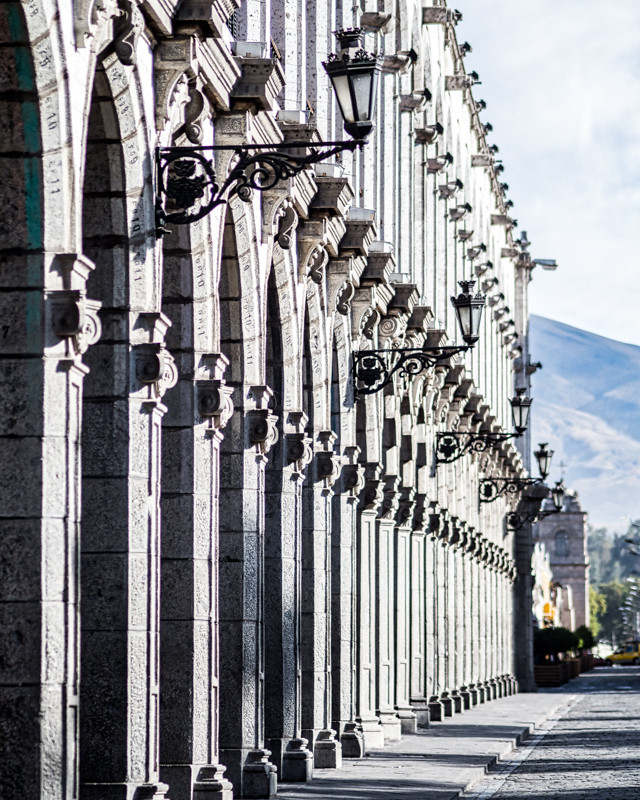 We hit the Monday morning commute traffic on our way out of Arequipa on Nov. 6. And we had to backtrack north and east around the El Misti Volcano to keep on paved roads to get to Puno – our next destination. 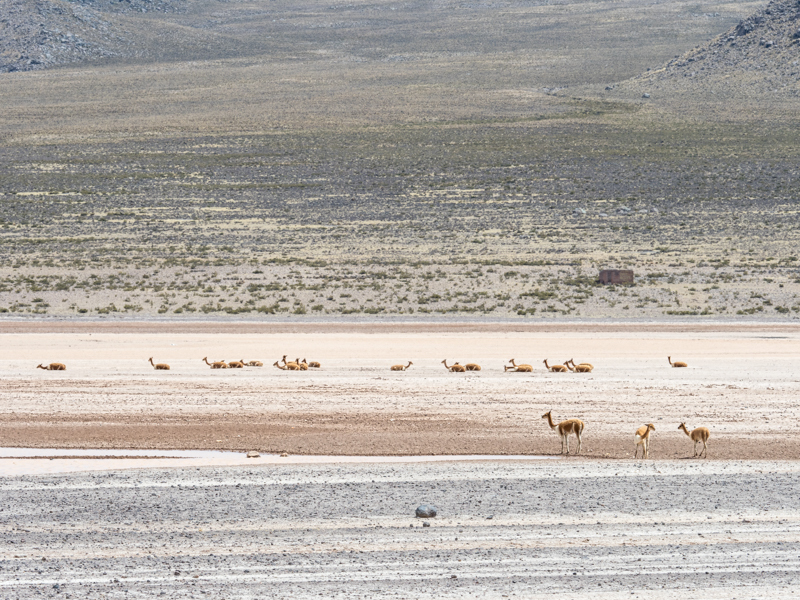 Vicuñas on the altiplano between Arequipa and Puno. We settled into the Casa Blanca Hostel 12km outside of Puno on the shores of Lake Titicaca in their walled-in yard. 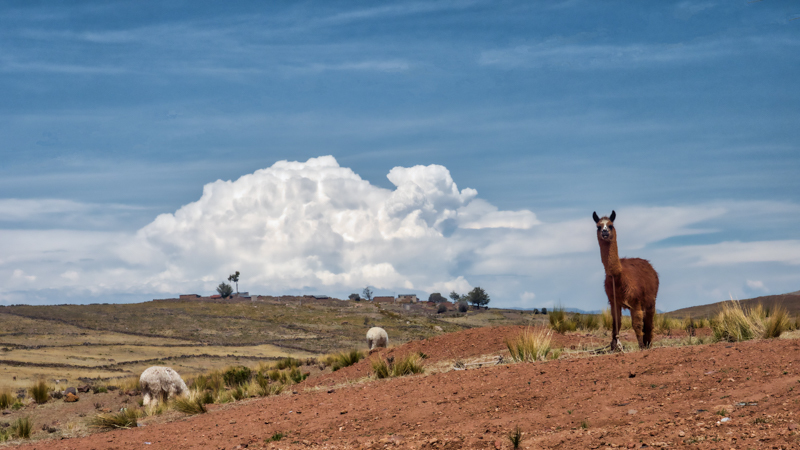 That night there was one other group of Overlanders traveling in a van; they were Swiss and had made the drive from Alaska to Puno in only five months. All they must do is drive. I’m so glad we can take our time and stay in one location for more than one night. 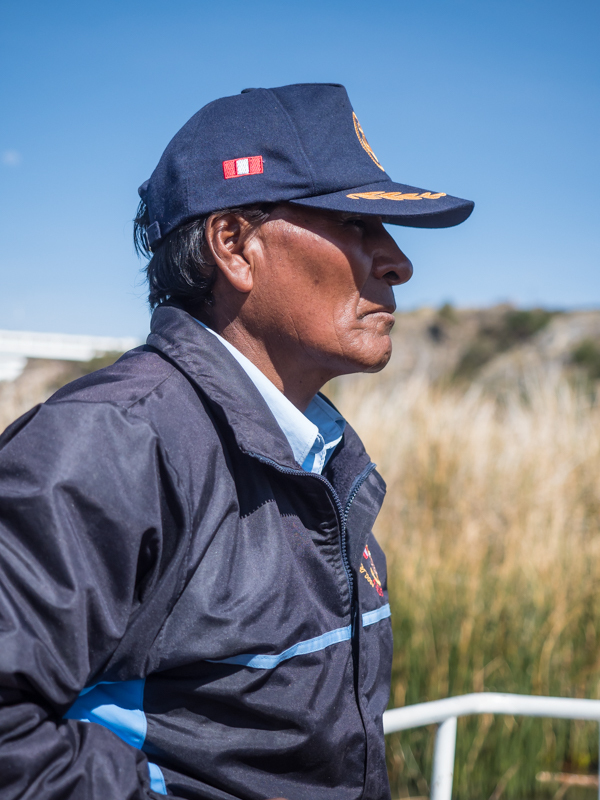 On Nov. 7th, we walked down to the road to catch a collectivo (shared van making short trips) but instead flagged down a taxi to take us into Puno and met Juan who was our courteous, friendly and safe driver for the next two days. Lake Titicaca. Puno in the background. 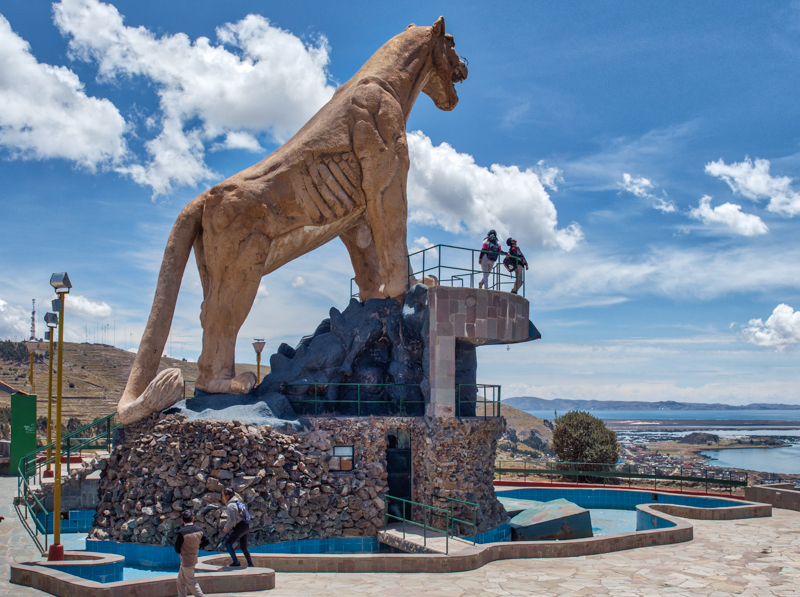 The first day we spent in and around Puno taking in the historic center sights as well as various overlooks around Puno. 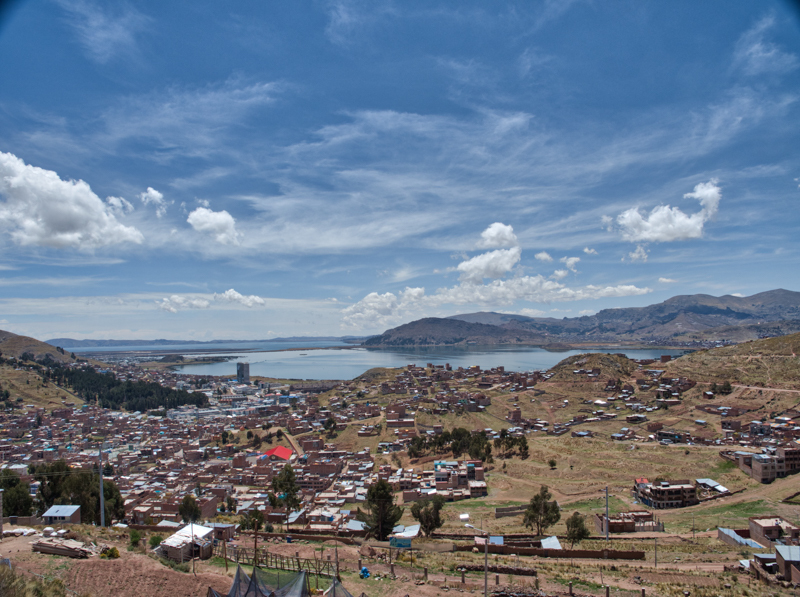 Puno is nestled in the basin of the hills surrounding it on a large sheltered bay in Lake Titicaca. Our ferry was captained by Pablo and was much slower than the tour boats. And not as maintained. 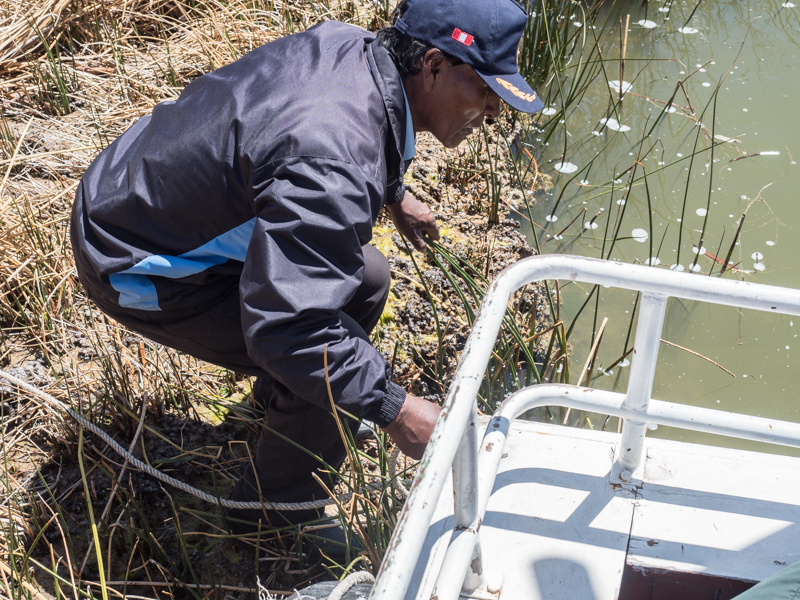 At one point on the return trip, the Captain had to pull over to a reed island, Dave held the mooring line while the Captain dug reeds out of the propeller. 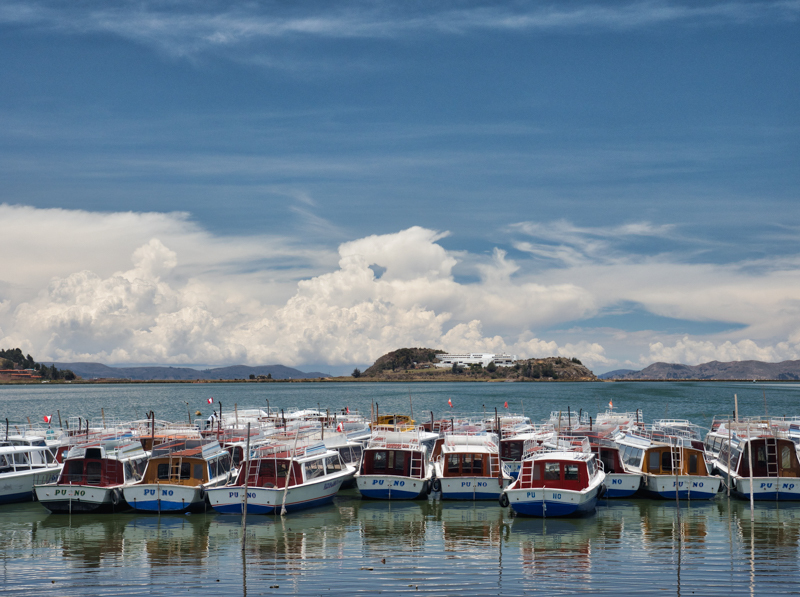 Ferry boats on Lake Titicaca. El Capitan Pablo Captain Pablo removing reeds that fouled the propeller. 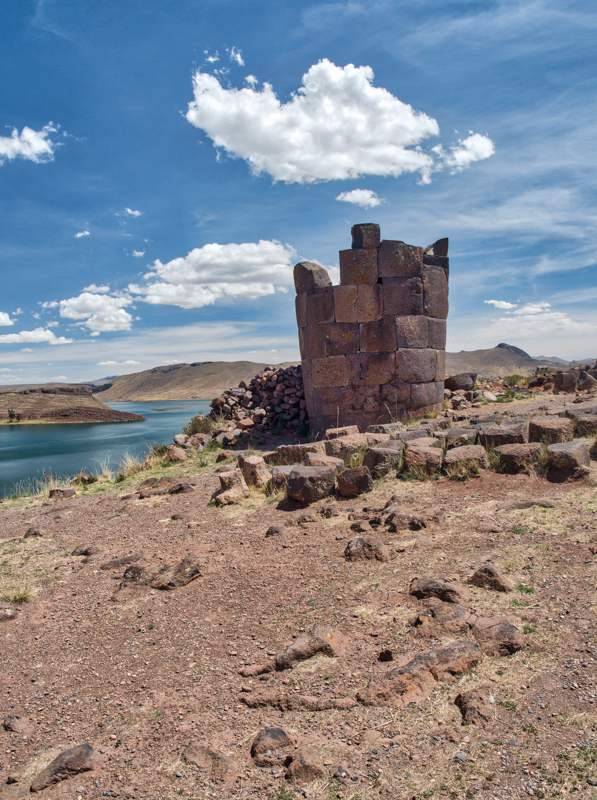 Once back at the dock, Juan picked us up and took us east to the Archeological site Sillustani. 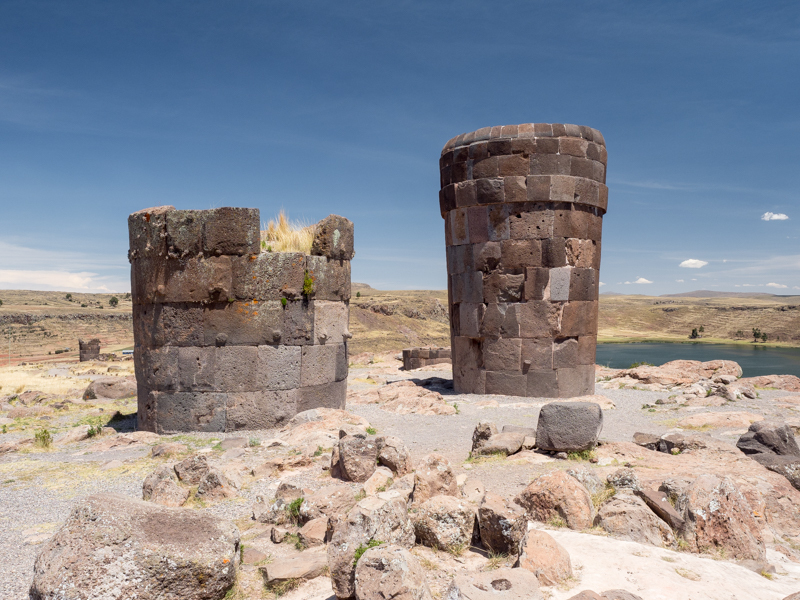 This site has high round stone towers that are believed to be Incan burial mounds. Fascinating but at that elevation with the hot sun blasting I was reminded of the saying “Only mad dogs and Englishmen go out in the hot sun midday.” I wonder which one we were. 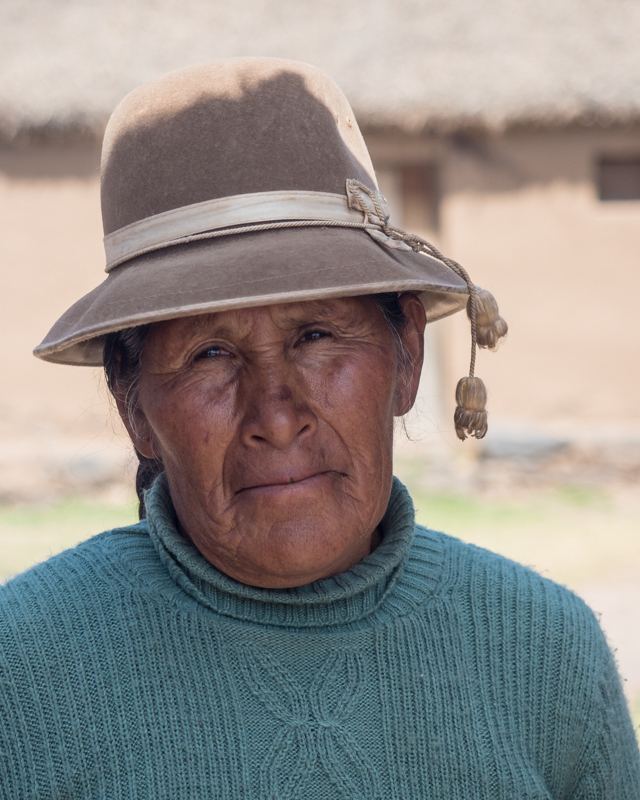 Portrait of a woman we met on the drive back from Sillustani. Seen on the drive back from Sillustani. 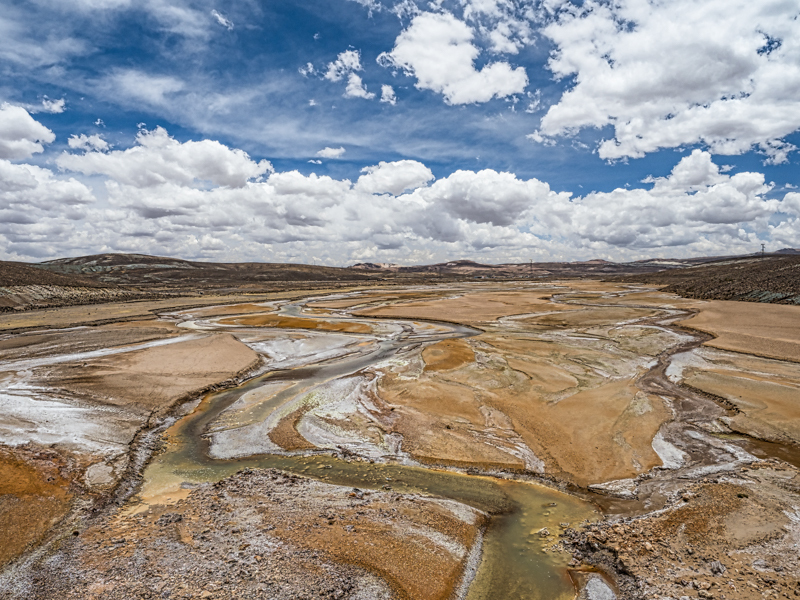 We left Puno on Thursday, Nov. 9th and drove back across the Altiplano to Moquegua. We saw maybe 30 vehicles all day. And the drop down out of the Altiplano to Moquegua reminded me of the desert environment around Arequipa. High elevation for the day was 15,021′ (4,578m). 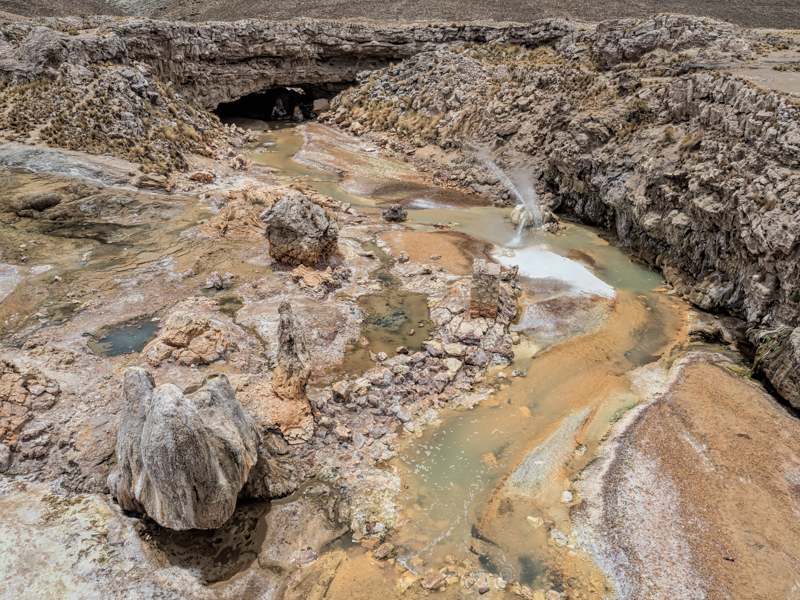 One stop was fascinating because after we stopped for photographing the sinuous river bed, we discovered on the other side of the road, a geyser erupting out of a block of rock stuck in the middle of the river. Another interesting sight was llamas (or maybe alpacas – too far away to tell for sure) grazing on sand dunes. I can’t imagine what they were foraging for. Once in Moquegua, we boondocked in front of the police station on the Samegua Plaza. Friday, Nov. 10th, we followed the Moquegua River verdant green valley on PE-1S back down to the sand dune country that we have discovered runs the entire length of Peru for about 30-40 miles inland from the Pacific where the foothills start. Makes total sense to have solar farms here. It never rains (average rainfall for the year is 18 mm or .71″) and it is sunny all day. We decided since we were within 30 miles, to go ahead and try to get across the border into Chile. We hate border crossings. There are never enough signs to explain where or what to do – even in Spanish. We have to rely on other Overlanders accounts and they’re not always accurate or clear. The first set of buildings we drove to were not the right ones. But not discovered until we drove around and parked. Guard came over and pointed us down the road. So we drove approximately 1 km down the road to another set of buildings. One Overlander’s account said park in the parking lot. But there was no parking lot on our side; I moved two orange cones for us to get to “a parking lot”. Which turned out to be wrong as another official came over in his vehicle and said “Not here, there”. “There” turned out to be 7 or 8 lanes of randomly parked vehicles. We parked in one of the lanes and went and stood in the line. The one good thing about this border crossing is that Peruvian and Chilean officials are in the same building and you simply move to one window to first sign out of Immigration in Peru, then right to next window for Chile Immigration. Then around the left side for Peruvian Customs for getting truck and camper out of Peru, slide over one window for Chilean Customs to get truck/camper into Chile. But First, you have to have the right forms. We must have looked pathetic because first agent dug up a blank form from behind his desk to complete on who and what was going into Chile. 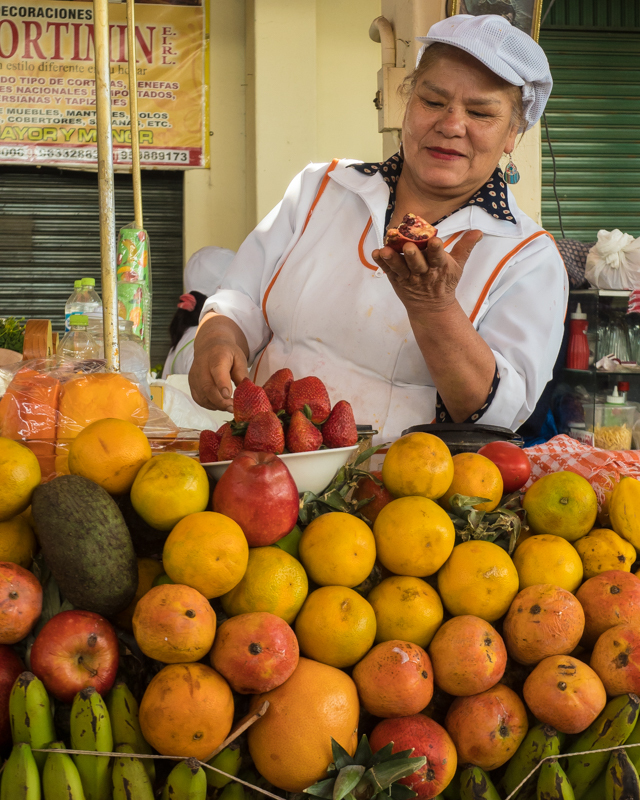 Another agent went and retrieved another set of forms to complete on what food we were bringing into Chile (no fresh fruits, vegetables, uncooked meats, raw eggs or honey.) And another form describing the vehicle we were bringing in. And of course, everybody has to stamp and date in multiple places. One form ended up with 5 stamps. Then you have to pull forward under the canopy for the actual inspection. But instructions were not clear and we went too far and it was a major hassle to back up under the canopy. Finally an inspector came through and I pointed out the various food items we had. She did confiscate the two sacrificial apples we had saved for this very purpose and cracked the four hard-boiled eggs to determine they were not fresh. Finally we were free to go into Chile. We drove 12 km down the road to the small recreational area called Villa Frontera to the Don Hugo campsite and called it a day. 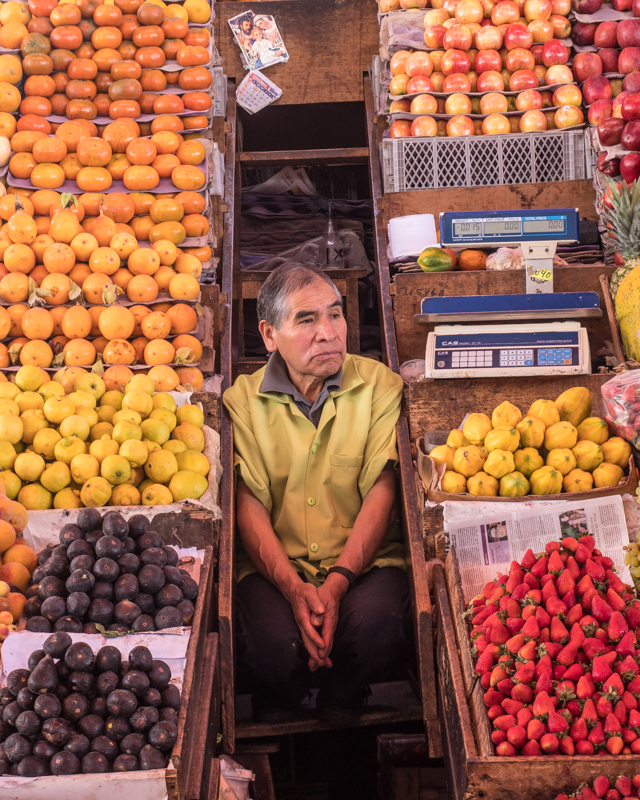 Peru – we spent 81 days and drove 5,733 km (3,562 mi.) zigzagging across the Andes in Peru. More about Arica and environs in next blog.